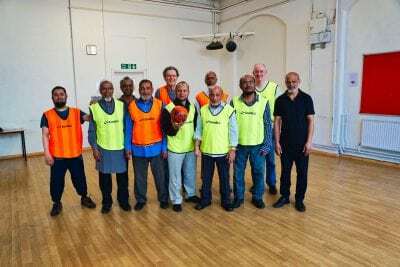 Claremont Project – Create, support, and join in with opportunities to shine and develop happier, healthier, and more connected lives. Opportunities to shine and develop happier, healthier, and more connected lives. Through the enormous generosity of some amazing and lovely people, we have now raised enough money to start the work to transform our building! We’re so excited and so grateful for the support. The Claremont building, which has been an important part of Islington’s community for over 100 years, will be around for many thousands of older people, and for the community at large, for at least another 100 years. We’ll be putting up more information about what happens next as soon as we can. In the meantime, we still need help! 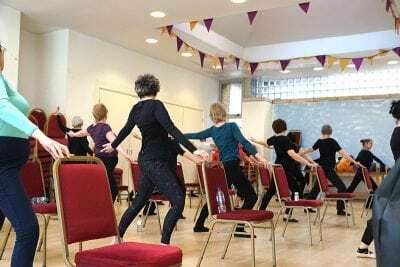 It costs us a lot to run so many high quality classes and events and we are not funded by Central Government or the NHS. We’re a small charity and need to raise all the money needed from good people like you – people who care about others having opportunities for friendship, community, and lives which flourish! Can you help us reach particularly isolated older people? Can you contribute to keep Claremont’s amazing services going? The vast majority of what we raise is spent directly on our charitable services and we make the most of every penny. Shared joy is a double joy; shared sorrow is a sorrow halved. Films and video clips from projects and activities. 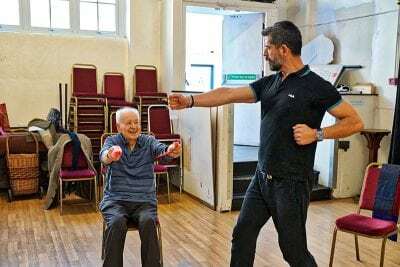 Generations: A collaborative impro project involving members of Claremont, All Change Arts, Improbable, Central St Martins, and Islington Giving. Click the “Expand in all Directions” icon to watch in full size! The Flamenco Dancers de Claremont! A short clip from our Variety Show, Summer 2018, this time from another fairly recently formed group. As with the Ukulele group, the Flamenco Dancers mostly had never danced this style before joining. There’s also now a Castanets group! Click the “Expand in all Directions” icon to see full screen. Claremont’s ukulele group in action. Most had not played an instrument before joining the group and Tim now leads them to ever greater heights! Click the “Expand in all Directions” icon to watch in full size! Fred “Realness” teaching Claremont the funky chicken. Follow along at home (or work) and enjoy! One of the many special events at wonderful Claremont. A video about Claremont, made some years ago now, but still relevant. It’s a general overview of some of our work. Click the “Expand in all Directions” icon to view in full screen. A fantastic operatic performance at Claremont from the lovely folks at Healthpitch. OMG, Francesca can sing!!! For details on this piece, see Healthpitch. Click the “Expand in all Directions” icon to see full size (and crank up the volume)! Just some of our many projects and activities. The date has nearly arrived when Claremont will again be at Tate Exchange! What: Come along and see Claremont exhibits on display every day, plus loads of free workshops including creative writing with Nichola on Friday and Gospel choir performing and delivering a workshop on Saturday. Our Madame Bovary project continues to cook up a creative storm - this time in the form of arts and crafts. Happy 12 years to the fantastic Up Your Street - thank you for all the signposting and support!